A large screened-in porch juts off the south side of this two-story house, providing the perfect venue for relaxation. Extending the slope of the home’s roof, the porch’s roofline gracefully sweeps west out across the Hudson River valley toward the Catskill Mountains. A carport abuts the north façade, bookending the home and adding visual interest to its massing. On the southern and western corners, overhangs provide shading from summer sun, while also breaking up the scale of the 3,800-ft2 house. All of these appendages appear to be seamlessly connected. They’re not. They are thermally isolated add-ons to a home designed for and constructed using prefabricated panels. These add-ons distract the eye from the basic boxiness of the underlying structure, which was optimized for panelized construction. Barry Price, principal and founder of Barry Price Architecture, is currently working on three panelized Passive House projects. He designed his first one in 2015 for an owner who wanted to maximize the home’s performance while minimizing the environmental footprint of the construction process. The soon-to-be owners of the two-story house, who had not heard of Passive House before consulting with Price, chose panelization based on the cost predictability when moving from schematic design to completing the shell. Price’s cumulative experience is helping him to perfect the art of the prefab design. For a variety of reasons, Passive House design and panelization are well-suited partners. Stripping a design to its simplest form facilitates both. “Because every corner is a potential thermal liability, you have to have a good reason to have more than four,” Price points out. One of his current projects does have six corners, because an L-shaped building makes better use of the site’s topography and features. Still, when he is sharpening his pencil and optimizing his designs, his plans aim for the fewest panels. Both approaches also require disciplined, engaged clients, notes Price. “A big difference with panelization is that traditional project delivery doesn’t apply,” he says. “And changes are harder.” The prefabrication process requires a heightened emphasis on planning and making binding decisions earlier than would be the case with stick-built construction. Window choices in particular have to be made early on for Ecocor, the panelization company he has worked with most frequently. Ecocor airtight wall panels come preinsulated with cellulose and generally include installed windows, which take three months on average to be delivered from Poland. You can still be polishing up the floor plans, and the clients are being asked to make window finish decisions—the trim colors both inside and out—when the kitchen design may not even be finished, Price says. And then, to ensure that the exterior trim color won’t clash with the siding color, that choice may have to be made as early as five months before construction starts. “It comes down to client engagement,” Price explains. “You have to have owners that get the process without feeling that their options are being limited.” When he first became a Passive House consultant, Price worried that introducing Passive House concepts to clients would be too challenging or risky for his firm. But he found he was wrong. Clients who opt for Passive House performance, he realized, understand that attaining that goal requires a certain amount of discipline. Similarly, owners who want the advantages of both Passive House and prefabrication understand that they will have to reconsider the usual order in which certain decisions are made. Of course Price also has his own early decisions to make, such as accommodating appendages and all penetrations. 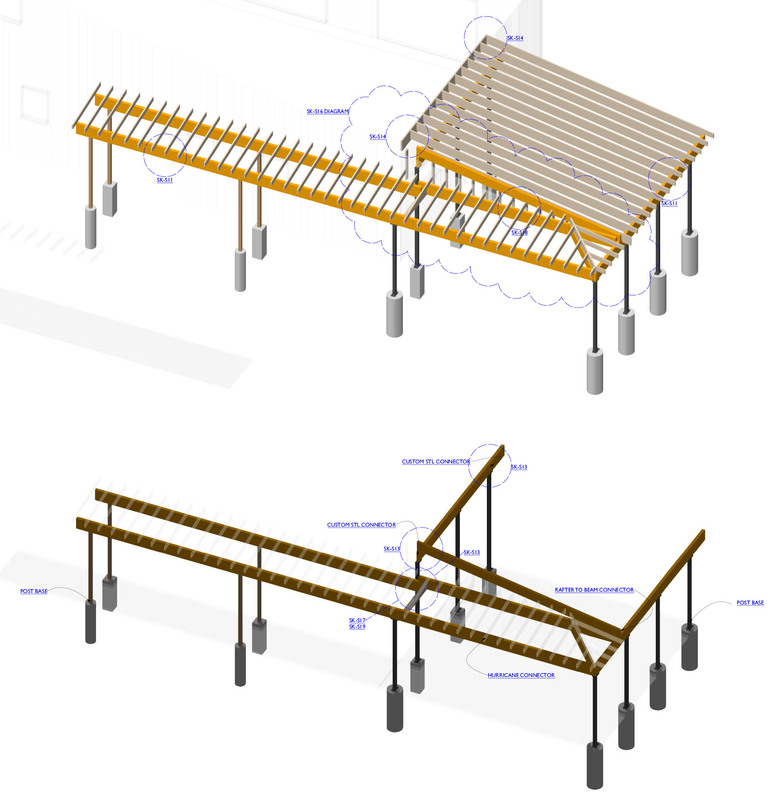 Integrating the prefabricated components with those constructed on-site, such as porch overhangs, requires solid planning. The structural details have to accommodate the blanket layer to avoid thermal bridges, which can be achieved either by building a parallel structure or by carefully flashing the ledger framing. Another decision that has to be made promptly is the location of any appliance that needs a vent hood or exhaust duct, such as a stove or clothes dryer. These penetrations affect the HVAC system calculations. This family had some particular preferences when it came to cooking; they wanted a gas-burning stove, which in this location means propane. They also wanted a fireplace for decorative heating. Both the range hood and the fireplace have their own makeup air systems. An ERV supplies the constant fresh air. Heating and cooling are provided by a ducted air source heat pump with three zones to distribute conditioned air upstairs and down. The four-bedroom home, which is clad in rough-sawn cypress, is intended as a weekend retreat and family gathering spot. The master bedroom suite is located on the ground floor to accommodate the possibility of retiring here. Until then, these owners will be able to enjoy this home’s superlative comfort, along with the comfort of knowing that, come freeze and power outage, their home will coast through these conditions just fine.